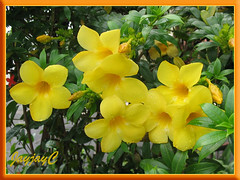 That’s how the showy trumpet-shaped flowers of Allamanda cathartica adorn its bush or vine, bountiful in terminal cymes and shining radiantly in rich yellow. An outstanding ornamental shrub that is ever-blooming, grows easily and requires minimal care. 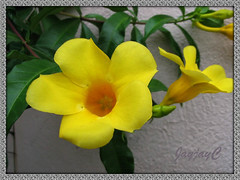 Like the bougainvilleas that thrive well in a hot and humid tropical environment, Golden Trumpet is seen grown almost everywhere in our beloved country Malaysia, outdoors in gardens, parks, public places, roadsides, highway medians, etc. and blooming spectacularly throughout the year. Plant type: Ornamental shrub or quasi-vine, native to Brazil but widely cultivated throughout the tropics. 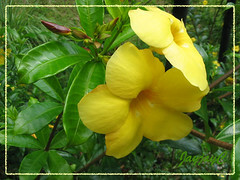 Features: Allamanda cathartica, a very popular species with some named cultivars and varieties, of the genus Allamanda, is an evergreen perennial in tropical climate but an annual in frost regions. A vigorous-growing scrambling shrub or woody quasi-vine that can reach 10-20 ft tall with support and spreading 3-6 ft wide, but can be pruned to a more desirable size in cultivation. Foliage is light green or bright to dark green in color, with glossy and leathery leaves (2-6 inches long) that are simple, oblong-lanceolate and pointed at both ends. They grow in whorls of 3-5 or in opposite pairs along the long stems. 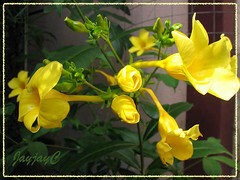 Golden Trumpet’s main attraction are the clusters of large funnel-shaped flowers in axillary cymes that are copiously borne at terminal branches. Flowers are colored in varying shades of fabulous yellow, from light to bright yellow or rich to golden yellow. These brilliant flowers with 5 overlapping petals, in single or double-form depending on the varieties, have varying sizes ranging from 2.5-5 inches in diameter. Flowers are short-lived, lasting about two days, but their abundance and year-round spectacular display make it much sought-after. It bears fruits that appear as prickly capsules which split open when ripe to release winged seeds that can be used for propagation. However, cultivated varieties rarely produce such fruits. All parts of A. cathartica including the white milky sap that exudes when broken are considered poisonous and highly cathartic, hence the botanical name. 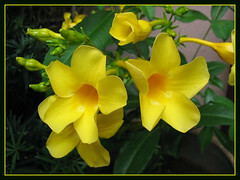 Because of its aggressive growth habit and tendency to coppice vigorously when trimmed, this allamanda species is listed as invasive/weed in some regions, notably in Queensland, Australia and Florida, USA. 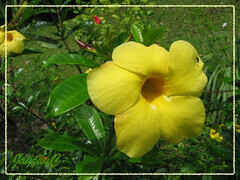 Culture (Care): A. cathartica can be easily grown with minimal maintenance in the tropical and sub-tropical countries. Light: Full sun to light shade, but grows and flowers best in full sun. Moisture: Medium water requirements and drought tolerant when established. Soil: Moist and well-drained humus-enriched sandy soil. Can be adaptable to many soil types but not salt or frost tolerant. A highly alkaline condition can cause it to become chlorotic. Others: Feed fortnightly with a water soluble fertilizer at half-strength. Prune selectively to shape as a shrubby bush or to maintain a presentable size. A hardy shrub that can take severe pruning, so trim regularly if necessary. If grown as a vine, its branches/stems need staking for support as plant does not bear tendrils. No serious pests or diseases, though occasionally bothered by caterpillars, whiteflies, mealy bugs and spider mites. Learn more on how-to prune. For sub-tropical regions: Hardiness: USDA Zone 9b-11. A summer annual and winter deciduous in frost regions, so grow in a container and overwinter indoors. Water sparingly during winter and prune in spring before growth begins. Propagation: From seeds which are rarely available on cultivated plants. The other alternative and easiest method is from stem cuttings that root easily on soil. Can even be propagated by division of the many sprouts which may emerge at the crown of the main plant. Usage: Spectacular flowering shrub for hedges and screens or ornamental specimen in gardens, parks and public places. Suitable too for landscaping along roadsides and highway medians. Ideal to be trained as a vine with support at porches and on trellis, arbors, fences and trees, as well as espaliered on a wall or cascade down a garden wall. It can be grown as a container plant, especially for greenhouses or to overwinter indoors in freezing climate. As noted at PMC site, in Suriname’s traditional medicine, the roots are used against jaundice, complications with malaria and enlarged spleen, the flowers as a laxative and it has antibiotic action against Staphylococcus besides wound healing activity. I’ve been searching the World Wide Web for my research on this field. I’m so appreciative of what you shared adds a new proportion to the data I’m accumulating. I truly appreciate the way which you look at this subject, it provide me a distinct way of looking at it now. Thanks for the share. I have a four year old well established Allamandra hedge. We have had a hard freeze for three nights here in New Olreans. Do you think the plants survived? I am planning on cutting them far back and watching to see if they will come back to life. Any ideas, thoughts, or advise? I have had one or two flowers on my bush in the eight years that I have had it what’s wrong??????????? Hi Jim! Could it be that your bush needs a prune? My Alamander has not flowed this year. The plant is extremely healthy with lovely green glossy leaves but no sign of flowers. It gets the western sun all afternoon. We have moved house so maybe this is the problem and I have realy pruned the plant back after flowering last year. Is there any fertilisor I can put on it to make it flower? Helen, we think any kind of flowering fertilizer should do the trick! We normally use the goat manure pellets that are sold at our local garden nurseries as fertilizer to enhance flowering and growth. Check out this site at http://www.gardening-advisor.com/Flower-Fertilizers.html which gives details about flower fertilizers, emphasizing that extra potassium is the essential macronutrients to boost blooming. Hi planted a alamander plant it grow well in a pot and on one morning i notice it starting to drupe & it dry up the next day what is the problem,cause it to dryup & look like i lose it. Hello! Found your article and the following comments great. I live in central Florida (The Leesburg/Villages area) an hour north of Orlando. Planted the Hendersoni Brown Bud variety of Allemandas in the front lawn which has full sun,8-10 hrs daily and the plants are a joy to behold. I planted them early summer and they’re thriving. My question is; I see that they’re becoming pale a bit now that the weather has changed, cool nights, still warm days. We do get some frost ocassionally for the winter season. If I choose to leave them in the ground will they die out and come back next spring? (2012). Hi Dannie! We hope site visitors here from temperate regions will be able to provide some answers to your enquiry or alternatively channel your question to some gardening forums please. All the best. 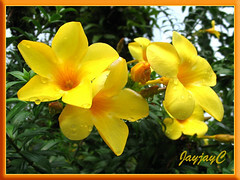 Will an allamanda and mandevilla flower on an screened patio. They are growing like crazy but no flowers. I am feeding it Bloom buster but still no flowers. Do they need bee/butterfly polination to flower? Thanks for your input. The plant needs to be in full sun for flowering. We normally use the goat manure pellets that are sold at our local garden nurseries as fertilizer to enhance flowering and growth. Hope these info helps and may your plant bloom abundantly for you.